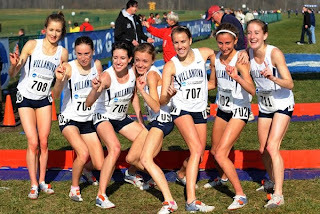 The Villanova Women won the 2009 NCAA cross country national championship last December, defeating the heavily favored defending 2008 champions from the University of Washington. Washington entered the meet ranked #1 in the country and Villanova was ranked #2. Comparing the 2008 and the 2009 nationals, one can get a better appreciation of how much Villanova improved from 2008, and how Washington's performance in 2009 failed to match its 2008 effort. Four Villanova runners from the 2009 squad ran in the 2008 national meet, held on the same course at Indiana State, where Villanova finished 6th. Their 2009 performances reveal just how much improvement occurred in the intervening year. Three newcomers to the 2009 meet were Sheila Reid (12th in 20:16), Nicole Schappert (26th in 20:38), and Brooke Simpson (51st in 21:01). Villanova's average time across the 6000 meter course improved from 20:54 (2008) to 20:24 (2009). Washington, on the other hand, failed to improve on its 2008 performance, despite returning 5 runners, including their top 4 from 2008. Washington had two newcomers in 2009: Allison Linnell (109th in 21:35) and Kayla Evans (136th in 21:48). Washington's average time went in the wrong direction, from 20:25 (2008) to 20:41 (2009). With the exception of Kendra Schaaf, who improved both place and time from 2008, the Washington runners either performed essentially the same as in 2008 (Follett & Lawrence) or fell off (Babcock & Campbell). At bottom, Washington's team did not improve from 2008-2009, while Villanova's did. The good news for Villanova for 2010 is that 5 of its top 6 finishers return and 2008 competitors Callie Hogan and Sarah Morrison come back off red shirts. Add high school all-american recruit Emily Lipari from Long Island into the mix, and it will be Villanova that has the target on its back. Time will tell if Gina Procaccio's squad will be able to handle the pressure in 2010 better than Washington did in 2009. Below is a video interview with the team immediately after the winning race, as well as a skype interview with Gina Procaccio.